The 15 separate wildfires ravaging northern California over the past week have now claimed 38 lives, the L.A. Times reported on Saturday, and scorched an astonishing 220,000 acres. Per the Times, the fires are not expected to go down anytime soon, with Cal Fire spokeswoman Jaime Williams telling the paper firefighters are facing “red flag warnings” of 10-20 mph winds that could gust up to 40-45 mph. The winds are likely to spread the fires even further, while the 10,000 firefighters in the area to fight the blaze have to contend with a wet winter/dry summer combination that has left the area covered in more potential dry fuel than they have seen in at least decades. The death toll is likely to rise; in Napa County alone, some 74 people remain missing out of 224 originally unaccounted for, the Times reported. According to NBC, hundreds of others remain unaccounted for in nearby Sonoma County. Lethal fires have included the Tubbs and Nuns fires in Sonoma County, the Atlas Fire in Napa County, the Cascade Fire in Yuba County and the Redwood Fire in Mendocino County, the Sacramento Bee reported. As the Washington Post reported, the fires’ paths have been both devastating and arbitrary, roaring through some neighborhoods while leaving other nearby houses untouched. 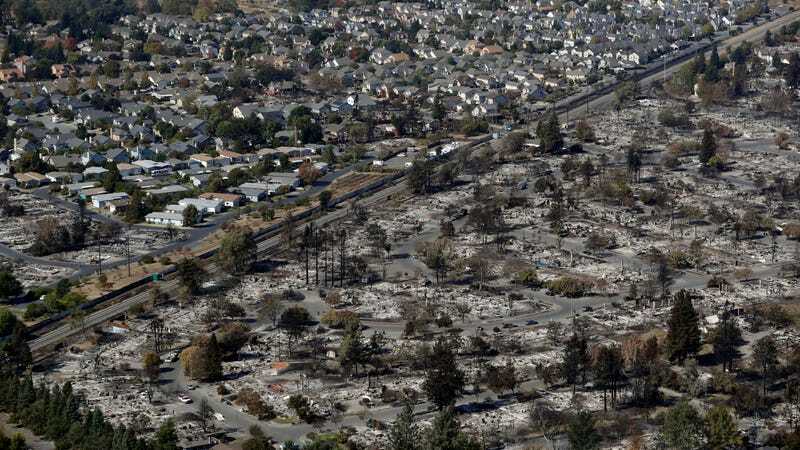 Wildfires such as the ones raging through northern California are often started accidentally by human negligence, but depend on hot, dry, and windy environments to grow to such massive sizes. The wet winter resulted in rapid growth of vegetation before much of it died off during a “dry and blistering summer that set temperature records around the state,” the MIT Technology Review noted. While the relationship between climate change and wildfires is complicated, mountains of evidence have connected warmer average temperatures to droughts and thus longer and more devastating fire seasons. Aerial surveys suggested over 100 million trees dried out during California’s drought, creating a huge stockpile of potential fuel. The conditions in the region this year are likely to not only be replicated in future years, but become worse with the passage of time. “... We know that the pathways by which temperature has influenced wildfire risks historically are relevant for the conditions in which this wildfire is occurring,” Stanford earth system scientist Noah Diffenbaugh, who studies the connection between extreme weather events and climate change, told the MIT Technology Review.